The Glengarry News, October 23rd, 1958, pg. 1, col. 4, 5, 6, 7, & pg. 4. col. 4 & 5. On Friday, October 24th, commencing at 2:20 p.m., ceremonies in connection with the unveiling of an historical plaque to commemorate John Sandfield Macdonald, will take place near his birthplace in the village of St. Raphael, Glengarry County. This plaque is one of a series being erected throughout the province by the Archaeological and Historic Sites Board of Ontario, which functions under the jurisdiction of the Department of Travel and Publicity. The Board is composed of nine private citizens including professional historians and archaeologists, as well as other persons noted for their activity in promoting increased interest in local history. Friday's ceremony is being sponsored by the Township of Charlottenburgh, and the Rev. Father Donald A. Kerr, P.P., of St. Raphael, will act as program chairman, Among those who are expected to take part in the ceremony are: the Rev. Father J. F. McCaffrey, S.J., director of the Martyrs' Shrine in Midland, a member of the Archaeological and Historic Sites Board, the Hon. Frederick M. Cass, Q. C., Ontario's Minister of Highways; Fernand Guindon, MPP (Glengarry); Osie F. Villeneuve, MP (Glengarry-Prescott); and George Brunet, reeve of Charlottenburg. The plaque will be unveiled by Ronald Macdonald of Alexandria, a grand-nephew of Ontario's first premier. John Sandfield Macdonald was born at St. Raphael, Glengarry, a county in which that surname is by no means uncommon on December 12th, 1812. His father, Alexander Macdonald. was a farmer, but agriculture seems to have held no attraction for the son. At an early age, Sandfield engaged in commerce and, at one time, was employed in a dry-goods store in Cornwall. However, he soon decided that law was his proper avocation and with his end in view, he attended the Eastern District School (Cornwall Grammar School) from 1832-35. He was fortunate here to be under such a capable scholar as the Rev. Hugh Urquhart, D.D. In 1835, Macdonald was accepted as a student at law by the Law Society of Upper Canada. He was articled to a Mr. McLean, a practising barrister in Cornwall, and later to Mr. W. H. Draper, who became Chief Justice of the Court of Common Pleas. Macdonald was called to the Bar in 1840 and set up practice in Cornwall. 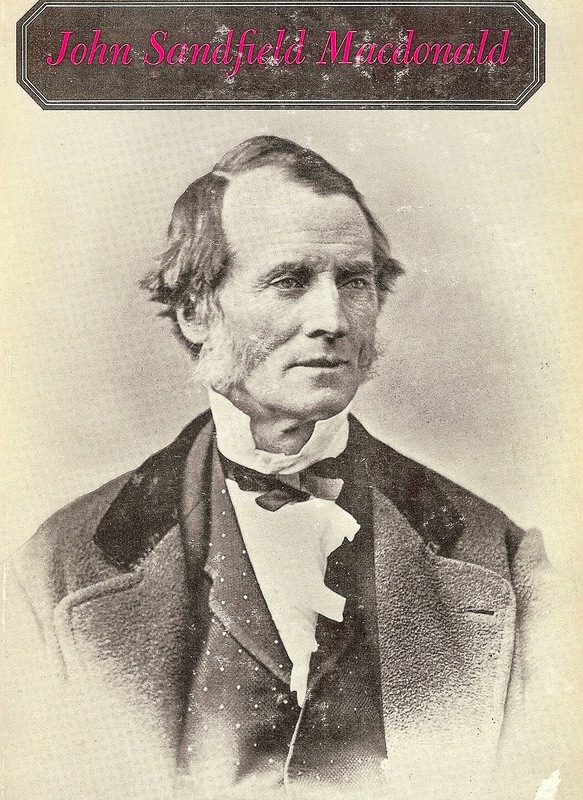 In 1841, Sandfield was elected to represent Glengarry in the legislative assembly of Canada and he sat for this constituency continually until 1857 and from 1857-1867, he sat for Cornwall. Although at the beginning of his political life he leaned toward the conservative element in the assembly, in 1844 he supported the Reform leaders against Sir Charles Metcalfe's attempt to thwart fully responsible government as proposed by Robert W. Baldwin. From 1849-51, he was solicitor-general in the second Baldwin-Lafontaine administration. From 1852-54 he was speaker of the house and, for a short time in 1858, attorney-general for Canada West in the Brown-Dorion administration. In 1862, Macdonald joined L. V. Sicotte to head a government and from 1863 to 1864 continued to lead it in conjunction with A. A. Dorion. Although a Liberal, Macdonald had no use for George Brown and the Clear Grit wing of the Reform party. As Confederation approached, Sandfield took a strong stand in opposition to it and to its chief proponent, John A. Macdonald. However,when Confederation became an accomplished fact he accepted it gracefully. In the tense period immediately following the establishment of the new provincial legislatures, John A., with his usual political acumen, prevailed upon Sandfield to head the first government of Ontario. The latter was as close to being an independent and objective politician as it was possible to find in Canada. He was a liberal but not radical in his philosophy; he was a Roman Catholic, but took a moderate view on controversial issues such as that relating to separate schools; he had worked during his career with men of diverse political outlooks, Above all, he was a man of integrity and courage who could be counted on to do his best to make the newly created government of Ontario a success. The cabinet which he gathered around him in his role as Ontario's first Premier became known because of its diverse political origins as the"Patent Combination". For over four years he administered the affairs of the province with prudence and economy. Late in 1871 he was defeated by the Liberals under Edward Blake. In his later years, Macdonald's health had been poor and he died in Cornwall on June 1st,1872. He is buried in the cemetery at St. Andrew's West.